Dear readers, I am very happy to share that my book “Kinect for Windows SDK Programming Guide” is now available with a great discount. You can avail discount of 30% on the eBook and 20% on the print on the ‘Kinect for Windows SDK Programming Guide’ book. This offer is valid until 31st Jan, 2016. 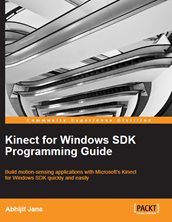 This book was published on Dec. 2012, and it covers the Kinect for Windows SDK v1.6 with Kinect Sensor v1. Thanks for your great response and feedback till now. Wish you and your family a very happy and prosperous New Year in year 2016. Time for a new beginning, new days and new year. May this new year bring many opportunities your way to explore every joy of life. I Hope this new year fills your life with happiness and perfect health always, much more success and happiness. New year brings new ideas, new hopes and of course courage to overcome all the new challenges. Five years ago today, I started Daily .NET Tips with a vision to have a single knowledge base of .NET tips and tricks and share post that can quickly help any developers. Yes it’s been 5 years since starting the wonderful space, that has become an integral part of my day to day learning! A heart felt thanks to all the readers and friends for all the support. Here’s wishing you all the joys of the season. Wish you and your family a Merry Christmas and a prosperous New Year in year in advance. May this good times become the golden memories of tomorrow for all of you. Wish you lots of love, joy and happiness. Microsoft User Group Hyderabad (MUGH ) invites you to Global Azure Bootcamp 2015 . This is scheduled on coming Saturday(25th April) at Microsoft Campus , Building 3 MPR Halls , Gachibowli, Hyderabad. It’s a one full day of deep dive sessions on Azure for Developers and IT Pro’s delivered by the experts to get you started on complex topics like Media Streaming, Mobile Services, Cloud App Development and IoT.